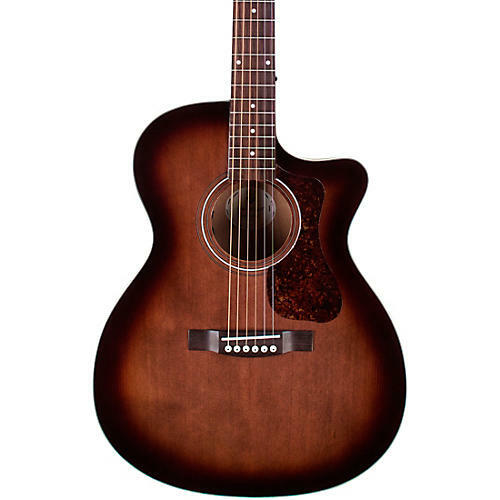 The OM-240CE with Charcoal Burst finish is an extremely limited-edition mid-sized orchestra-shaped acoustic-electric guitar equally suited for strumming and fingerpicking. It produces a sweet, balanced tone that is perfect for the versatile musician. This OM-240CE Charcoal Burst features a solid Sitka spruce top, mahogany sides, arched mahogany back, and an elegant cutaway for access to higher frets. Guild’s signature arched back design gives the OM-240CE great volume and projection, long sustain, and a lush, full sound. This cool guitar also includes Guild’s AP-1 pickup, bone nut and saddle, pearloid rosette, period-correct tortoiseshell pickguard, and a matte polyurethane finish. The OM-240CE also comes with an optional pickguard you can put on your guitar for extra style points if you so choose. The OM-240CE comes with a deluxe padded gig bag.